I will be posting to my research blog, which you can follow if it takes your fancy! If you can't find the right pages in the pdf files, just press ctrl-f and search for 'verbs of motion'. with diminutive (affectionate) forms of first names: Kasiu! Grzesiu! Hanu! Generally related to the English preposition 'with' or 'by' when referring to transportation. Answers the questions-whom am I doing something with? With what am I doing something with? I am talking on the phone with Joseph. I am traveling by train. This is also a case of location, most commonly used with "Z" or with." also Przed-in front of Nad-above Pod-under, bellow Za- behind. The indirect object (always the person to whom something happens or is given: she gave me her address). The direct object of most verbs; the object of some prepositions. Answers the questions: What is the action is about? Whom the action is about? I see the tree. I see what? The tree. I see Mark. I see who? Mark. We would like to visit Krakow . What would you like to visit? Krakow . I have a new dress. What do you have? A new dress. Most common verbs used: I see, I have, I like. Other examples: I am going to buy a plane ticket. I am going to buy what? A plane ticket. I am going to sell my car. I am going to sell what? My car. The accusative also follows preposition that indicate going towards or motion. Pzez-through Na-on, to, towards, for I am going to the market. I am waiting for my love. I will be on vacation. I am walking through the building. The case that marks a noun as being the possessor of another noun (which is why it's also widely known as the possessive case). Thus "Danuta's brother" is brat Danuty (or Danuty brat) and "father's automobile" is samochód ojca (or ojca samochód). 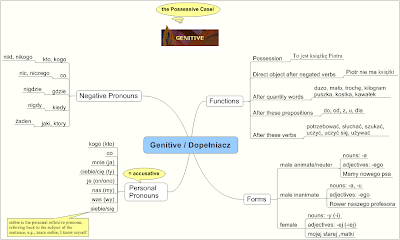 with direct object after a negated verb (thus Mam klucz (I have a key) with the accusative is negated as Nie mam klucza (I don't have a key) with the genitive). after words naming quantity or measure (corresponds to of in English: szklanka herbaty (a glass of tea), dużo czasu (a lot of time). after certain verbs, such as: potrzebować (to need), słuchać (to listen to ), szukać (to look for), uczyć (to teach), uczyć się (to study, learn), używać (to use). Cardinal Numbers from 5-21, 25-31, 35-41, 45-51, etc... are followed by the genitive plural (thus Zyzio ma sześć lat, Tomasz ma piętnaście samochodów). Finally, genitive is used with a wide range of prepositions. Several express the starting point of moton: z domu (out of the house), z koncertu (from the concert), od Danuty (from Danuta). Other prepositions requiring the genitive case are u (by, in the presence of), do (to, into), dla (for, on behalf of), and bez (without). Answers the questions: What is it? Who is it? It is a Park. What is it? a park. It is Mark. Who is it? Mark. The park is green. What is green? the park. The man is walking. Who is walking? the man. Usually used with the verb "to be"
This is the case that simply names the entity in question and does not mark its dependence on any other word in the sentence. It is the case of the subject of the sentence. In English, the role a noun plays in the sentence is indicated mainly by its position. When we hear Stan loves Barb we recognize Stan as the subject of the sentence (the source of the affection) and Barb as its object (the direct object of the sentence). In Barb loves Stan the different word order assigns different sentence roles to the two nouns.